Some cooks add bean curd and oc (large snails, in which case the dish is called bun rieu cua oc). Green leaves and herbs, along with sliced banana tree stem, are mainstay accompaniments. If you wanna travel to Vietnam but don’t know anythings about Vietnam travel, you can look at in this topic. Travel for just a week in Vietnam and you’ll realise how few of its gastronomic specialities see the light of day beyond its borders. Every region lays claim to unique edible delights – well-known classics such as northern pho, Hue imperial banquet fare, and southern salad rolls are just the tip of the culinary iceberg. Thank the northern knack for turning humble ingredients into something sublime for this crustacean-flavoured soup. It’s made from paddy crabs, packed with tomato chunks, green onions and bun (rice vermicelli), and capped with a floater of sautéed crab fat. Some cooks add bean curd and oc (large snails, in which case the dish is called bun rieu cua oc). Green leaves and herbs, along with sliced banana tree stem, are mainstay accompaniments. One of the tastiest relics of Emperor Tu Duc’s reign is banh, steamed rice cakes eaten with a drizzle of fish sauce. Whether eaten plain, dotted with chopped mushrooms, or stuffed with chopped dried shrimp, these dainty Hue bites make the perfect light breakfast or between-meal snack. Heatloving central Vietnamese often add a dollop of chilli sauce. Thick and chewy turmeric-yellow noodles are topped with shrimp, pork, bean sprouts, herbs and chopped peanuts, and are moistened with just a bit of rich broth. Named for its native province of Quang Nam, the dish comes with rice crackers for crumbling and is finished in characteristically central-Vietnamese style, with a dab of sweet-hot chilli jam. A veritable hedgerow of unusual greens and herbs, many of which are gathered wild from riverbanks and rice paddies, features in this Trang Bang District do-it-yourself roll-up of thinly sliced pork and cucumber, accompanied by pickled garlic, daikon and carrots. Everything’s bundled into rustic rice papers, which have, as the name of the dish suggests, been ‘exposed in the dew at night’, and dipped in nuoc cham. 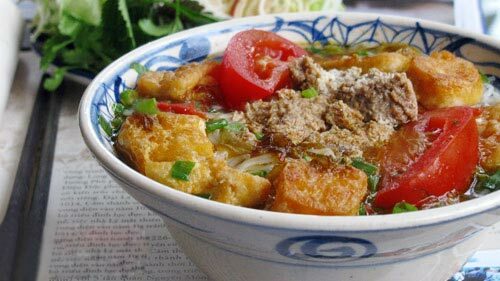 This beautiful, tangy tamarind-flavoured soup embodies the Mekong Delta’s abundance: from its waterways come fish; from its fruit plantations, pineapple; and from its fertile soil, tomato and spongy bac ha or taro stem. The region’s rice paddies contribute the cuminlike herb rau rom. Accompanied by rice it’s an unpretentious yet appetising meal in a bowl. These small sweet-and-savoury prawn pancakes are made from ground rice and coconut milk batter that’s cooked in special half-spherical moulds, resulting in a crispy crust enclosing a soft centre. A speciality of Ba Ria-Vung Tau province, they’re eaten rolled with herbs in a lettuce leaf.